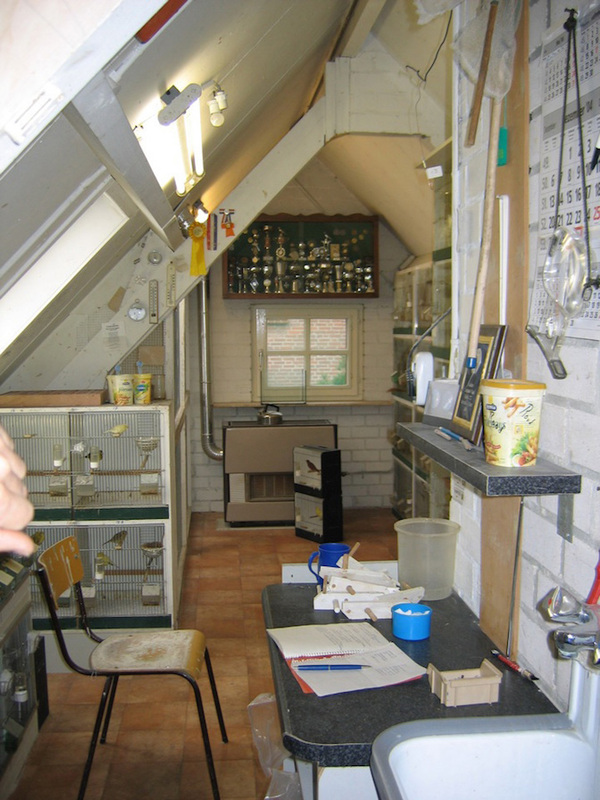 An e-mail arrived from my friend Harry Kapel, a silver medallist with a Lizard canary at the World Show in 1998, and well known to many British breeders. It was a club notice for a show in Meijel, the Netherlands. My Dutch is very basic, but the first sentence was clear enough: Op de internationale vogelshow in Meijel is dit weekeinde de uitgestorven London Fancy weer voor het eerst te zien op een vogelshow sinds bijna 100 jaar (at the international show in Meijel this weekend, the extinct London Fancy can be seen for the first time at a bird show for almost 100 years). I was astounded. I called Harry. Within a couple of days he had tracked down Theo Minten, the author, and had arranged an appointment for me to visit the breeder, Piet Renders. I booked a flight to Schiphol in January (so that I could combine my trip with a visit to the Dutch National at Apeldoorn), Harry collected me, and we were on our way. Piet is well known now, but at the time there was an understandable concern about security. He appeared to have achieved the impossible, and there was a clear risk that some visitors might not have the best of motives. With Harry’s support, I was invited up to the attic where Piet kept his breeding stock of London Fancies. I was not disappointed. Before me was a bird that, on first sight, was the London Fancy. I felt I had travelled back in time – by two centuries. 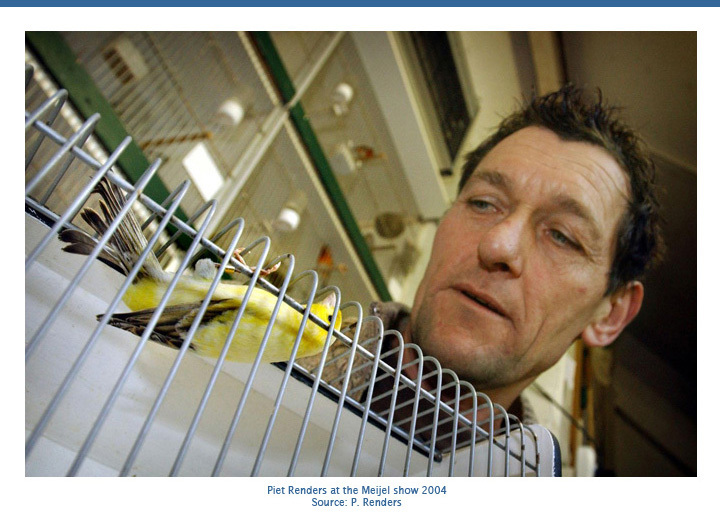 Piet started out as a foreign bird keeper (Gouldian finches and Red Hooded Siskins were breeding during my visit) and, if I remember correctly, he had embarked on his quest to recreate the London Fancy only three years before. One of his foundation birds, a clear cap gold hen Lizard was still there. 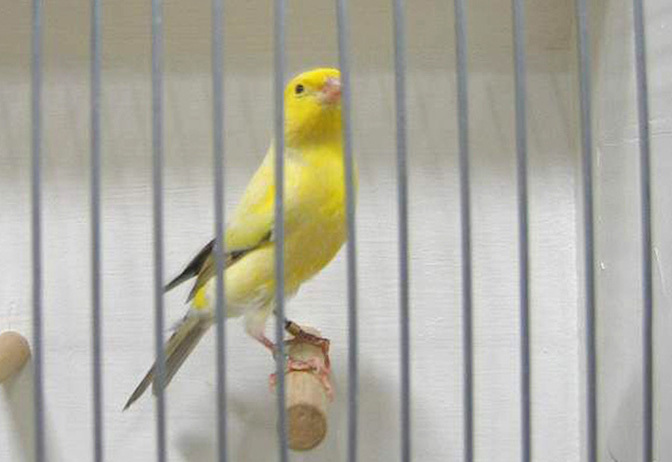 He had gone from variegated hybrids to a yellow canary with dark wings and tail in just three generations. Luck? Skill? Know how? It was certainly fantastic. On closer examination, I realised this wasn’t the genuine article, but a very good impersonation: the claws were flesh cloured; Piet told me the underflue was only partially black; there was no distinct cap; and the ground colour was a mealy yellow rather than rich gamboge. Those are minor criticisms in the context of Piet’s real achievement: he had demonstrated that the fugitive melanin gene (more of that in a future post) could be re-established in a modern canary. Without that gene, the other details are meaningless. That was about 11 years ago, and Piet has continued to develop his strain. The quality of the birds continues to improve, and his ‘strike rate’ of birds that can be identified as London Fancies (including spangle-backs) rises. We will follow his progress in future posts. Will British fanciers get to see them? YES! I am told Piet will be at the Stafford National on 11 October, with his birds. If they are as good as in previous years, they will be the stars of the show.